Please send your order id on Whatsapp or SMS at +91 9644371050, we will provide you real time status of your order. You can also do alternation in your order in Whatsapp or SMS only. You can also email us at sales@www.swagshirts99.com to know your order status and makes changes in your order. You can also call us at +91 9644371050 to know the order status and to make changes in the order. Feedback on the website – try to give more filters to be able to search the products and more pictures of the product, for eg how does the T-Shirt look from behind and in close up etc. sure, our developers team is working on it..
Im in the US. How long will it take to ship to me and how much will it cost? $14 and 10 business days. How to check whether my order has been shipped? I had made an order on 9th but no message regarding despatch was received. 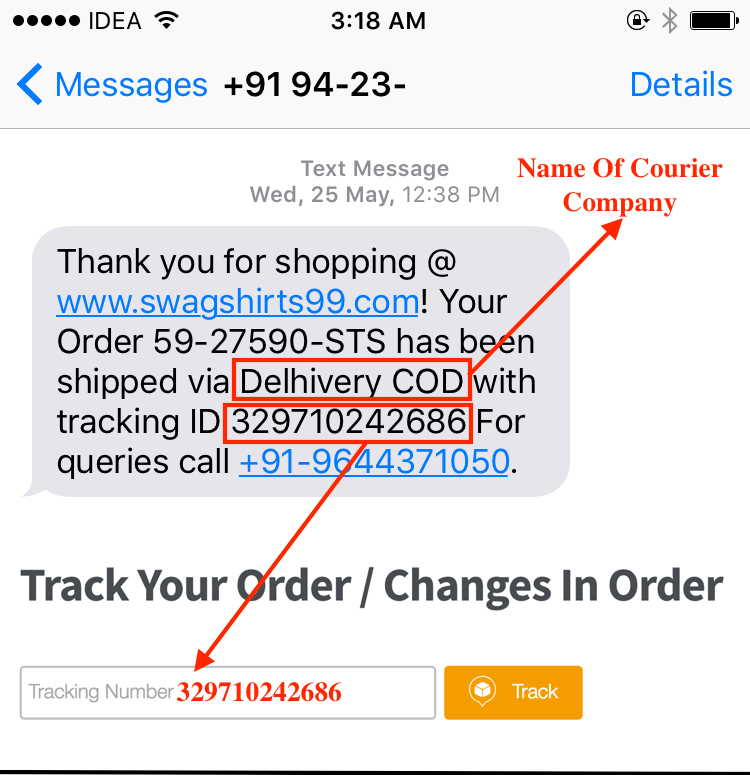 Hi Sir, You will get SMS with tracking and courier details when your order gets shipped. Please make sure provided correct mobile number. Please text us at whatsapp or sms at 9644371050 and we will make changes instantly according to your request. I wanted to know if I could cancel an order..?? hello sir, order is cancelled as per your request. Hi guys..how long will it take to reach Aizawl,Mizoram? payment got deducted but order not placed via payment gateway? Hi Megha, please contact us urgently on whatsapp or sms at 9644371050 with order your id urgently. even after multiple emails my refund for the failed transaction has not been processed. very disappointing. hi Megha, please whatsapp us or call us directly at 9644371050, and please provide your email id because we dont recieve any email recently for failed transaction, please give call on urgent basis. Want to change my delivery address ? delivery address is update as per your whatsapp request. you will get tracking id and courier via automatic SMS in 48 hours. Its been 4 days of my order…still i cant track my order on ur site…please tell me real time position of my order….will appreciate!! Hi, Wishlist feature is added to our website, thank you so much for pointing that out. My order 58487 is still on hold. I called you guys and have confirmed it and was told that it will be processed soon. What’s going on ??? how to change the size of the shirt i ordered today? please provide order id and new size you want to update. Hey i ordered a hoodie last week it still hasn’t shipped and i have already paid. I have tried to contact you via mail, WhatsApp, sms and you haven’t responded. I really would like to know the the status of my order.